Greetings from the IPSI Secretariat in Tokyo, Japan. IPSI and its members continue to stay active in a wide variety of projects and activities related to maintaining and revitalizing socio-ecological production landscapes and seascapes (SEPLS). We are particularly thrilled this month because the dates have been set for the Sixth IPSI Global Conference, to be held in Cambodia in January 2016. 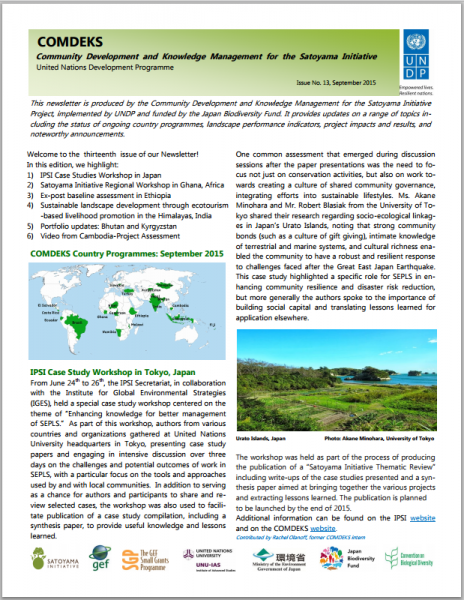 This month’s newsletter contains information on a major new project under IPSI, called the “GEF-Satoyama Project”. We are also happy to let you know that the Official Report from the recent Satoyama Initiative Regional Workshop in Africa has been completed and is available for download. We are also looking forward to IPSI members’ active participation in the upcoming meetings for the Convention on Biological Diversity, and happy to announce that the Secretariat will be hosting a side event about IPSI at that event. We also would like to share information about a recent event related to ecoagriculture and the Satoyama Initiative held in Taiwan, and the latest issue of the COMDEKS newsletter. We are happy to announce that the dates for the Sixth IPSI Global Conference (IPSI-6), to be held in Siem Reap, Cambodia, have been set. IPSI-6 will be held from 12 to 14 January 2016, consisting as usual of a meeting of the IPSI General Assembly and a Public Forum, plus chances to visit nearby sites, socializing and other events for participants. Detailed information on the conference programme and others will be sent to relevant parties soon. For inquiries about IPSI-6, please contact the IPSI Secretariat. IPSI partners Conservation International Japan, the United Nations University Institute for the Advanced Study of Sustainability (UNU-IAS) and the Institute for Global Environmental Strategies (IGES) recently announced that they are collaborating in a new project, called the “GEF-Satoyama Project”. The project focuses on SEPLS, aiming to mainstream conservation and sustainable use of biodiversity and ecosystem services, while improving human well-being in production landscapes and seascapes. The project consists of three main components: field-level demonstration of sustainable management of biodiversity and ecosystems services in selected priority SEPLS; knowledge generation and management for SEPLS and developing analytical and training content for a range of stakeholders; and capacity building and inter-sectoral collaboration for ensuring social and ecological values in priority SEPLS. The project has chosen to focus field-level support in three “Target Geographies”, namely, the Indo-Burma, Madagascar and the Indian Ocean Islands, and Tropical Andes Biodiversity Hotspots. The GEF-Satoyama Project has opened a Call for Proposals for site-based projects in the Indo-Burma Biodiversity Hotspot. Funding through GEF funds will be available for a maximum of USD 100,000 to each selected project. Projects are expected to make larger global impacts through leveraging additional resources, replication and knowledge sharing under the GEF-Satoyama Project. The Call for Proposals will be open until 18 November 2015. For details on the GEF-Satoyama Project and the Call for Proposals, please see the CI websitehere. 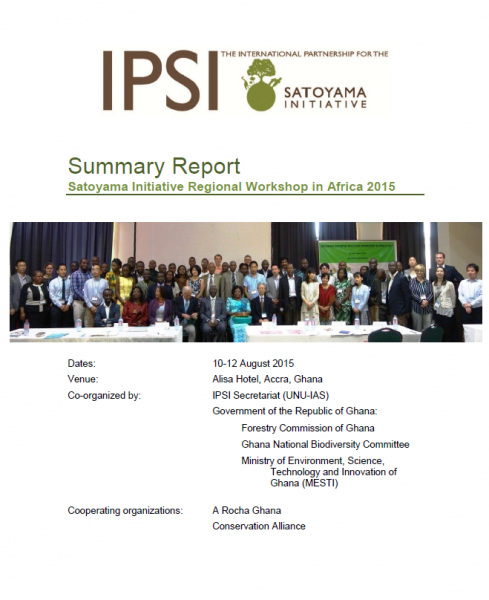 The official report for the recent Satoyama Initiative Regional Workshop in Africa, held from 10-12 August in Accra, Ghana, has been completed and is now available for download at the link below. The report contains a great deal of information about the workshop, including summaries of speakers’ presentations and outcomes from the lively discussions. More information about the event is available on the event announcement page here. The IPSI Secretariat is looking forward to sending staff members to take part in two upcoming meetings to be held in Montreal, Canada for the Convention on Biological Diversity: the Nineteenth Meeting of the Subsidiary Body on Scientific, Technical and Technological Advice (SBSTTA-19) from 2 to 5 November, and the Ninth Meeting of the Ad Hoc Open-ended Working Group on Article 8(j) and Related Provisions (WG8J-9) from 4 to 7 November. We look forward to providing support to all of our members who are parties to the Convention and also to seeing a lot of friends from the IPSI community. If you or your organization is planning to attend either or both of the meetings, please be sure to contact the IPSI Secretariat and let us know. We will also be sharing more about side events and other information relevant to IPSI as we receive it. We look forward to hearing from you, and hopefully seeing you in Montreal. The event will feature speakers from the IPSI community talking about the Satoyama Development Mechanism (SDM), collection and synthesis of case studies from around the world, and the “Indicators of Resilience in Socio-ecological Production Landscapes and Seascapes”, plus comments from relevant parties to the Convention and others. Light refreshments will be served, so we hope to see many of our friends there. For up-to-date information, please see the event notice on the IPSI website here. 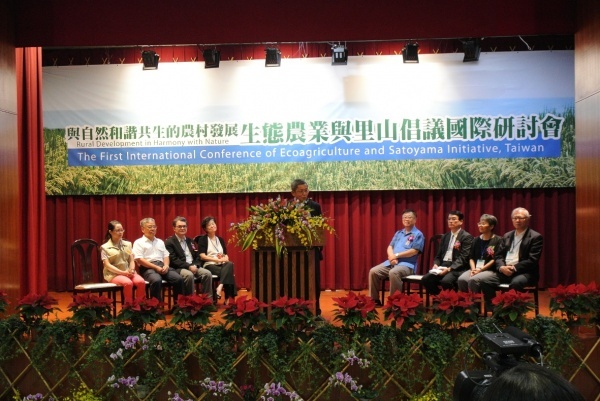 The First International Conference of Ecoagriculture and Satoyama Initiative, Taiwan was held on September 23 2015 in Jian Township of Hualien County, Taiwan. IPSI members SWAN International and National Dong-Hwa University were organizers and collaborators of the conference, together with Hualien District Agricultural Research and Extension Station (HDARES), Taiwan’s Council of Agriculture, Forestry Bureau and Rural Development Foundation. The conference aimed to share experience and knowledge relevant to the Satoyama Initiative and Ecoagriculture in Taiwan, as well as how relevant concepts and practices have been implemented globally. Wataru Suzuki and Kaoru Ichikawa from the IPSI Secretariat were invited to present the basic concept of the Satoyama Initiative, the formation and development of IPSI, and the Indicators of Resilience in SEPLS. Speakers from several other IPSI member organizations were among the speakers, including Prof Kuang-Chung Lee from National Dong Hwa University, Dr. Jung-Tai Chao of Swan International and representing the Taiwan Forestry Research Institute, and Ms. Yun-Ru Fang of the Environmental Ethics Foundation of Taiwan (EEFT). The speakers and participants were provided with a wide variety of opportunities to learn about SEPLS management on the east coast of Taiwan. It was also mentioned that there is a strong hope to establish a national network in Taiwan for the Satoyama Initiative. If this comes to be realized, it will be the second national network, following Japan where the initiative was first proposed. Throughout the conference, it was impressive that the concept of the Satoyama Initiative has been incorporated to various levels of projects on the east coast of Taiwan in close collaboration with national agencies, research and educational institutions and local communities. These activities in Taiwan can provide valuable lessons for all IPSI members. A more detailed report can be found on the IPSI website here.